Mayor Dan DeLano discusses aspects of the state Department of Transportation’s project on South Union Road, which includes repaving and reducing the number of lanes from four to three within the project limits. The project was an aspect of his portion of the “State of the Village” address held on April 8. 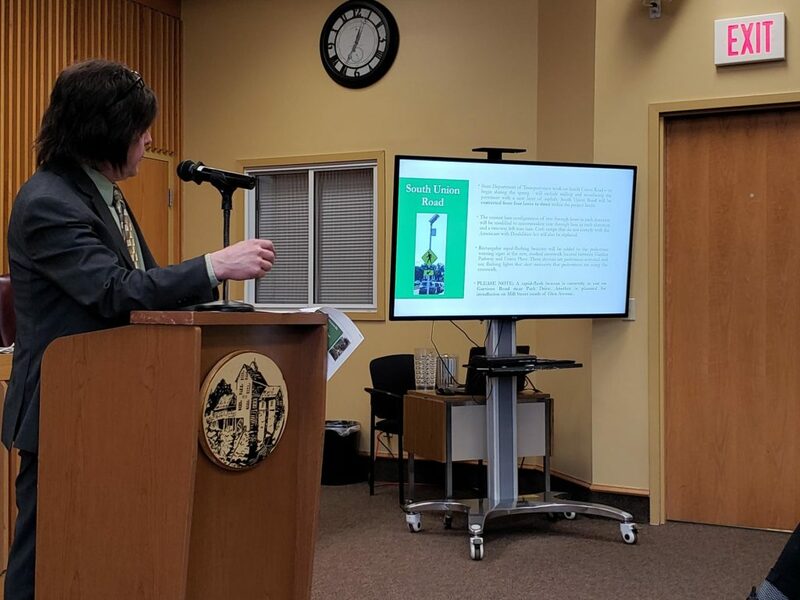 The Williamsville Village Board on April 8 hosted the 2019 “State of The Village” address, offering updates on current and future projects as well as detailing the 2019-20 proposed budget, which is below the state’s 2% tax cap. The proposed spending plan of approximately $3.96 million would increase by 1.41 percent from the current budget. The village estimates that the tax rate is estimated to increase by 32 cents, from $3.88 per $1,000 of assessed valuation to $4.20 per $1,000. The Village Board is scheduled to hold a vote on the proposed budget during its Monday, April 22 meeting. Also during the address, the mayor and trustees provided reports on the respective departments and committees to which they liaison. Trustee Matt Etu discussed the Parks Committee’s plans to create a Guidance Document for the future of the village’s parks. As a prelude to the document, the committee has created the 2019 Village Parks Survey, which is now available on the village’s website. The portion of the address relating to the Parks Committee updates can be downloaded by clicking the button below. To view the full “State of the Village” presentation, click the “download” button below.